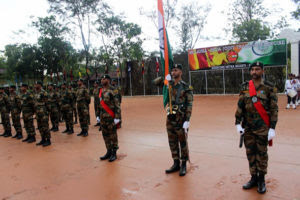 India and Sri Lanka will conduct joint military exercise Mitra Shakti VI from 26 March to 8 April in Sri Lanka. At the military exercise Mitra Shakti VI, India would be represented by the Bihar Regiment. Gemunu Watch Battalion of Sri Lankan Army will be representing the Sri Lankan side. The exercise aims to build and promote close relations between armies of both the countries and to enhance the ability of joint exercise commander to to take military contingents of both nations under command. Q. India and which country will conduct joint military exercise Mitra Shakti VI from 26 March to 8 April?